Welcome to O'Fallon Childcare & Learning Center! We are a not-for profit child care service licensed with the State of Illinois, and a member of the Illinois State Board of Education Food Program. Our commitment to our community includes participation with state supplement agencies including Children's Home & Aid (CHASI), grandparent and foster children support care. Established in 2002, we have striven to offer the highest quality programs possible. Here you will find a safe, intimate environment that promotes healthy development and growth for your child. We serve children 6 weeks to 12 years of age. 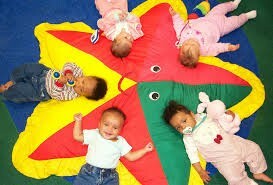 Our qualified Early Childhood Teachers are committed to excellence and age appropriate care for your child. We welcome your telephone calls and your visits to our facility. Putting your child’s future first! Our mission is to provide children/families with a Safe and Developmentally Appropriate child care program. We will support children and their families in an intimate and caring environment by providing a stimulating early childhood educational experience. • Curriculum is designed to support healthy physical and emotional environments. • Providing an individualized approach to learning that will be developmentally appropriate. • We will provide a literary rich environment that recognizes and respects diversity. • We will promote family and community involvement in early childhood development. At the heart of any successful program is a curriculum foundation that not only effectively meets a full range of outcomes and objectives, but also supports teachers in a way that allows them to confidently provide new and exciting learning opportunities every day.